Helen Saker-Parsons follows up her article on Tsar Alexander II, and considers how Alexander II’s death influenced his son, Tsar Alexander III. The results included suspicion against those inside and outside of Russia, and making scapegoats of the Russian Jewish population. Alexander witnessed his father’s body as it was stretchered up the stairs of his home in the Winter Palace; the stubs of his blown-off legs hemorrhaging blood onto the plush carpet. His father was Alexander II, Tsar of Russia and assassinated by social revolutionaries. His son, the new Tsar Alexander III, accepted that he was their target now: affirmation of which came on his return to his own St Petersburg residence, Anichkov Palace, where he discovered a trench had already been dug, encircling the building, and several armed guards put in place. Alexander III knew that his father had survived several assassination attempts, the threats of which lingered throughout his reign. Indeed, the policies the new tsar pursued and the way he lived his life were governed by fear. Although physically strong, he was no match for an organized group of assassins. To protect himself and his family he was forced to assume a near isolated existence, away from the social whirl of the Imperial court; and moreover to introduce a set of domestic and foreign policies which would keep his enemies at a distance. Tsar Alexander III of Russia in the 1880s. St Petersburg itself symbolized revolutionary spirit: a contemporary English observer remarked how the city reeked of dynamite. Following Alexander II’s assassination in March 1881, Alexander III took his family and fled to their country residence, Gatchina, some thirty-five miles to the south. Here he chose to live more like a prisoner than an Emperor. He dismissed the opulent rooms and instead moved into converted servant quarters that were low ceilinged and cramped. He surrounded himself with Victorian bric-a-brac to further the sense of claustrophobia. Rumors abounded abroad about the new tsar’s confinement. 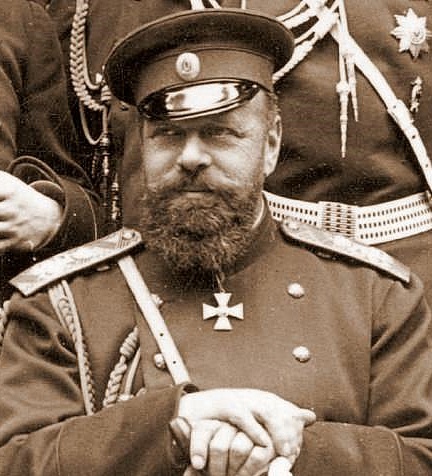 He listened to the advice of his former tutor: the reactionary and influential Konstantin Pobedonostsev, who warned him to “look under all the furniture at night and lock the doors not only in the bedroom, but in all the adjacent rooms, right up to the outside door.” He further advised to “check every evening, before going to bed, that the sentries are still there – their throats can so easily be cut.” Alexander kept a revolver beneath his pillow and allegedly fatally shot an aide-de-camp who surprised him as well as a guard who reached behind his back for a cigarette. Rumors abounded abroad about the new tsar’s confinement. To counter these claims, he and his family took frequent public walks in a nearby park but the image of freedom was an illusion: the park was reached via an underground tunnel from the Palace and a fear of large crowds forced Alexander to delay his coronation for over fourteen months. It was this sense of mistrust that governed his foreign policy. Often referred to as ‘Alexander, the peace-maker,’ it was more paranoia that forced his decisions. Although he ratified the Three Emperors League with Germany and Austria-Hungary, which his father had initiated in 1881, he failed to further extend the alliance in 1887 when he became suspicious that Austria was acting against Russian interests in Bulgaria. Instead he signed a Russo-German neutrality pact, but again refused to extend this in 1890, when the ascension of Kaiser Wilhelm pushed Alexander into the hands of the French. Alexander was suspicious of the ambitious German ruler and in 1892 signed a military pact with France to counterbalance German aggression in Europe. But ultimately the Tsar believed he had only two natural allies – his army and his navy. Alexander III acknowledged that a threat also existed from within. His domestic policy was governed by his desire to maximize the security of his dynasty. He followed the doctrine of his grandfather, Tsar Nicholas I, with ‘orthodoxy, autocracy and nationality.’ Only by having one religion, one people and one leader could he maintain peace within Russia and eliminate threats from the Radicals and Reactionaries. He pursued a policy of Russification, promoting the Slavic elements within the Empire and removing Prussian ones. All aspects of life were affected from Alexander sporting a Slav-like beard to persecuting other religions. Russian art, music and architecture were promoted. School curriculums were altered to reflect the glories of Russia and universities were instructed on what to teach. Perhaps his most controversial policy was the persecution of the Jews. Pobedonostsev’s formula for the Jewish was: ‘one-third was to emigrate, one-third was to die, and one-third to disappear (or be converted).’ Strict quotas were introduced on the number of Jews admitted to higher education and Jews were banned altogether from many professions. Their settlement was restricted to nominated areas and towns closed to them. In 1891, almost twenty thousand Jewish inhabitants were evicted from Moscow. Although the pogroms - which were a feature of Tsarist Russia from 1881 - were not government led, they were welcomed by it. The Jews were a useful scapegoat and a focus for hatred: diverting attention away from revolutionary activity. The emancipation of the serfs in 1861 had forced many uneducated peasants into the cities where they came across the wealthier Jews who they resented. This hatred grew as an international agricultural depression was blamed on the Jews who largely controlled the trade and merchant houses. But the tsar could not divert all hatred from him. The social revolutionaries needed to be suppressed and Alexander achieved this through censorship [the country’s main literary journal Notes of the Fatherland was closed in 1884 for its supposed support of Populist political ideas], the promotion of police powers and consequent clampdown on civil liberties. In 1881 the Law on Exceptional Measures, - in effect martial law - was introduced; meetings of any kind could be banned, and the police were given extensive powers of search and arrest, while liberal judges and officials were dismissed from office. Perhaps most importantly, a new security division of the police was founded - known as the Okhrana. Not only were they responsible directly for the protection of the Tsar and his family but also for tracking down political opponents and radicals. This they achieved through subversion and infiltration. They were successful and effective: by 1894, over 5,400 people had been exiled to Siberia or sentenced to hard labor. The long hands of the Okhrana operated not only from the major cities within Russia but those European hotbeds of revolutionary behavior such as Paris and London. Alexander III kept his enemies at a distance and flexed his muscles on the international and domestic scene. Even so, his desire to appear powerful and fearless infiltrated every aspect of his life, and ironically was to contribute to his death. At six feet four and with a large stature (his nieces and nephews referred to him as ‘Uncle Fatty’) Alexander III was an imposing physical character. He kept his children amused with feats of strength such as ripping whole decks of cards in half and bending fireside pokers into bizarre shapes. But his most significant display of strength came following a train derailment near Borki in 1888, on one of the few occasions he had travelled beyond the confines of the royal palaces. As bodies lay amongst the tangled mess he reportedly supported the roof of the dining car in which he and his family were travelling, allowing them all to escape. He suffered a trauma to his back and damage to his kidney, heralding the onset of kidney disease that contributed to his death six years later. An alleged tendency towards alcoholism brought about by the stresses of confinement worsened his health. Although Tsar Alexander III escaped the fate of his father and son, he remained imprisoned by the fears his role as ruler of an unruly Russia invoked and ultimately died an untimely death at the age of 49. As always your feedback is welcomed. If you have the time to leave a comment I’d really like to hear what you thought about the article. Now, look at what else is on the blog by clicking here.